Have you ever wondered whether security systems are actually effective in preventing crime? The short answer is yes. Studies have shown that simply by having a security system, your home is much less likely to be targeted by burglars and thieves in the first place. We’ll explain exactly how effective a security system can be in protecting your home. According to three different studies conducted by two universities and the National Institute of Justice, burglars are much less likely to target a home that has visible security system elements in place (think cameras, lighting, stickers/signs) than a home that appears unprotected. While each study was conducted in a different place and at different times, the results were overwhelmingly similar. In the Cromwell-Olson-Avary study, which was sponsored by the National Institute of Justice, more than 90% of the 30 burglars interviewed said they would not choose a target with an alarm system, and 75% said they were deterred simply by a sign or window sticker. In other words, with all other factors being equal, they’d rather move on to an easier target than take on the additional risks an alarm system provides. In another study conducted by the University of North Carolina (UNC) Charlotte, researchers asked over 400 convicted burglars about their motivations and methods. Over 80% reported that they would try to determine whether a security system was present before attempting a burglary, and 60% said they would move on to another target if there was an alarm present. Half of the subjects also reported that if an alarm went off while the burglary was in progress, they would abandon their attempt and leave. The Rutgers University School of Criminal Justice conducted a four-year study of the relationship between break-ins and the presence of home security systems in New Jersey. They found that a security system not only deters burglars from breaking into a home, but it acts as a protection for nearby homes as well. Having several homes with security systems in the same neighborhood or community deterred burglars from the entire area. These specific elements make a burglar’s task harder and less likely to be successful, thereby helping to prevent crime. Security cameras have proven to be particularly helpful in deterring crimes. 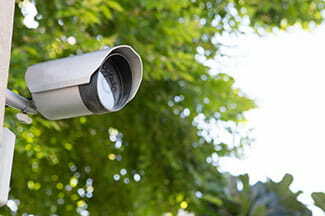 In a study that examined the effect of security cameras on public surveillance (not residential), a high number of well-monitored cameras proved effective in lowering crime rates in public places. The saved costs of these deterred crimes offset the cost of the surveillance equipment. Similarly, just seeing a security camera—whether it’s real or a realistic fake—will deter a majority of burglars from attacking a home. Burglars don’t want to be seen or recorded, and cameras make that much more likely to happen, even in an empty home. Cameras have even been helpful in stopping crimes in progress. Thanks to modern technology, you can find cameras with motion detection settings and set them up to text or email you if they are triggered. This lets you know right away if someone is in your home, and you can call the police and take action immediately, increasing your chances of stopping or catching the intruder. Well-positioned cameras can even help recover stolen items. For example, in December 2012, a Texas father was able to review the security footage from the camera installed over his front porch to discover that a UPS worker had stolen a Christmas package off the porch, and the item was eventually replaced. It’s generally pretty difficult to recover stolen items, and according to the FBI’s crime statistics for 2014, only 13.6% of reported burglary cases were closed, so anything that can help you or the police track down a thief is going to be useful. Quality — A higher-quality image will be more useful in identifying thieves than footage that is grainy or difficult to see. Night vision — Night time offers burglars the advantage at going undetected in the dark, so cameras with quality night vision capabilities are an excellent way to counteract that. Motion detection — Instead of recording footage all the time, some cameras with motion detection will turn the camera’s recorder on when triggered, helping you focus directly on anything suspicious instead of sifting through hours of footage. Placement — Be thoughtful in the placement of your cameras. Position them around the entrances to your home (the most likely break-in points), as well as high-traffic areas inside your home, such as hallways or walkways. To get an idea of the top security cameras, hop on over to our security camera reviews to find a camera that fits your needs. No one wants to be a victim of a break-in, and having a security system in place will help protect your home in more ways than one. Security cameras, alarm systems, and even stickers and signs advertising a home security system are effective deterrents to burglars looking for a target home. Thieves are much more likely to move on to easier targets with fewer risks. Visible security cameras in particular will make a thief think twice about breaking in your home, and with today’s technology, a camera can help you stop a crime in progress or even help you recover stolen items. 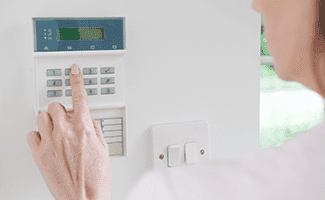 There are always lots of factors to consider, but studies demonstrate that home security systems aren’t just for show, but really can help protect your home. Check out our annual best home security system review to find the system that is best for you and your family.